Caverns of Mars is a fairly unique gem in the Atari game library. It was developed in 1981 by Greg Christensen for the Atari 8-bit computer line. Greg was a high school senior when he wrote Caverns and sent it to the Atari Program Exchange (APX). APX was a division of Atari that was set up to sell programs developed by others for Atari’s 8-bit line. Caverns won the 1981 APX game contest and was released by Atari in cartridge, cassette, and floppy disk formats. Caverns is similar to Scramble, except the action is vertical, rather than horizontal. The idea of the game is that Martians are surrounding Terra IV (your planet) and you must defeat the Martian forces by sabotaging their defense system. The goal of Caverns is to guide your ship to the bottom of the cavern, while avoiding enemy fire and laser gates. There are four types of enemies that you can shoot to gain points: transmitters, creon rockets, pyxias rockets, and space mines. You can also shoot fuel tanks, which will give you additional fuel. If you are good enough to navigate your way to the bottom of the cavern, you must land on the fusion bomb, activate it, and escape from the cave before it explodes! The Atari 5200’s design is similar to an Atari 8-bit computer, except that its memory is limited and some memory locations are mapped in different locations. Thus, it has been possible to port over a number of 8- bit games to the 5200. Steven Tucker has developed a multi-cart for the 5200 and he has also ported over a number of 8-bit games, including Caverns of Mars. The 5200 version is available to be played in Steven’s multi-cart or may be purchased in cartridge format. Caverns plays well on the 5200 and control on a standard 5200 joystick is not too bad. Although not as easy to control as a digital joystick, after some practice, Caverns is fun to play. If you are a fan of Scramble or like space themed games, you will enjoy Caverns on the 5200. 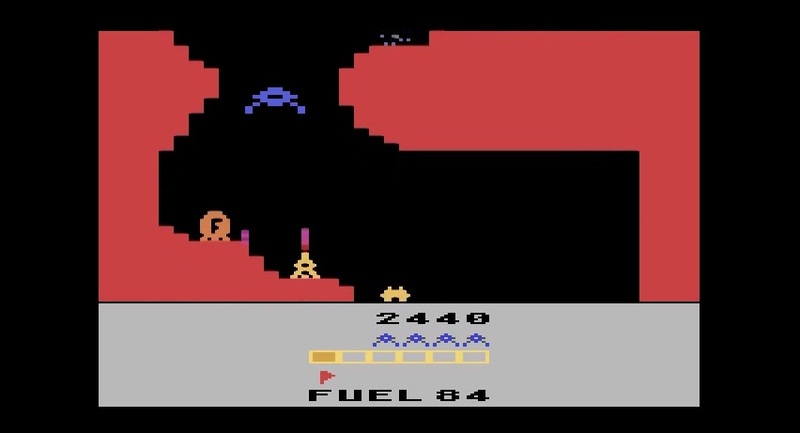 Caverns of Mars was included as one of the forty-two games on the Atari Flashback 2. This version was probably a prototype that Atari developed for the 2600, but never released as there is no credit to any programmer in the Flashback 2 manual. Although the graphics are simplified and there is quite a bit of flicker, Caverns is fun to play on the Flashback 2. In fact, the rapid fire capability in this version, makes the game a little easier to play and, thus, a little less frustrating for beginners. In 2006, John Champeau, released a 2600 version of Caverns which he titled ‘Conquest of Mars’. This is an excellent port featuring improved graphics over the Flashback version and little to no flicker. While the graphics overall are not quite as good as the original 8-bit version, they are very well done for a 2600 game. The gameplay is also intact and had this been released by Atari back in the 80’s, it would have been a monster hit for the 2600. John keeps the laser torpedo fire rate similar to the original 8-bit version, so his Caverns is more challenging to play than the Flashback version. On the other hand, control with a standard Atari joystick, is much better than with the 5200’s analog version. Sadly, no 7800 version of Caverns has been developed, but John’s 2600 version plays perfectly on the 7800. With recent advances in cart boards for the 7800, maybe someone will develop a 7800 version that will be able to improve on the original. Conquest of Mars is an outstanding game that can be played on Atari’s entire 8-bit line of computers and game systems. It may take a little searching to find a copy of the computer version, but the 2600 and 5200 versions are readily available and, at about $30 a copy, are, relatively, affordable. As mentioned above, anyone who likes Scramble, Super Cobra, or space themed games, will love Caverns. All of the versions of Caverns are fun to play and worth having in your collection! Categories: 2600, 5200, 7800, Atari, Game Reviews | Tags: 2600, 5200, 7800, 8-bit, Atari, VCS, XEGS | Permalink. 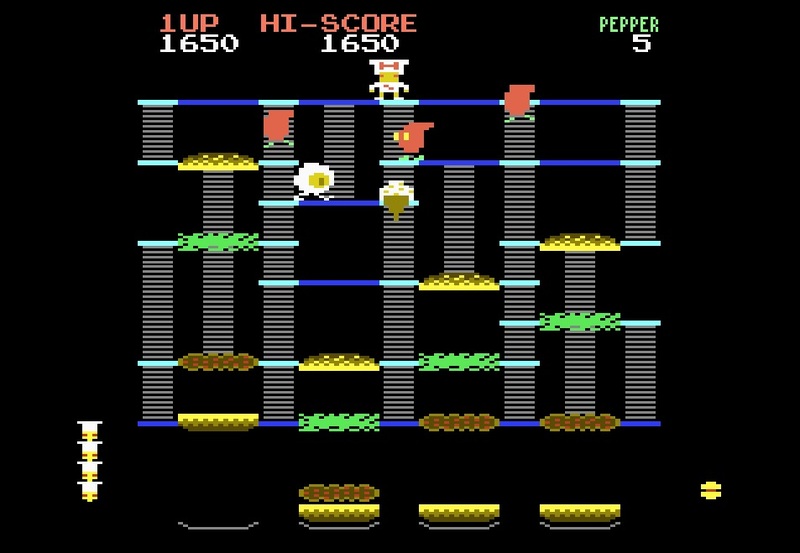 BurgerTime is a 1982 video game developed by Data East and distributed by Bally-Midway in the US. The game was originally called Hamburger, but was re-named before being released in the US. BurgerTime was a major hit for Data East and it was offered as both an upright cabinet and as a cocktail table. The BurgerTime arcade units were powered by a 6502 CPU, had mono sound, and used a standard 19” CRT. Peter must avoid these antagonists to keep from losing a life. He can either out maneuver them, cause them to drop, drop hamburger ingredients on them, or spray them with pepper which ‘freezes’ them for a few seconds. Peter has a limited number of pepper sprays but, periodically, a bonus food will appear on the maze, allowing Peter to earn an ‘extra’ pepper spray. BurgerTime was ported to a number of home consoles of the era including the Atari 2600, the Colecovision, the Intellivision, and the NES. The 2600 version of BurgerTime was released by the M-Network (Mattel) in 1982. 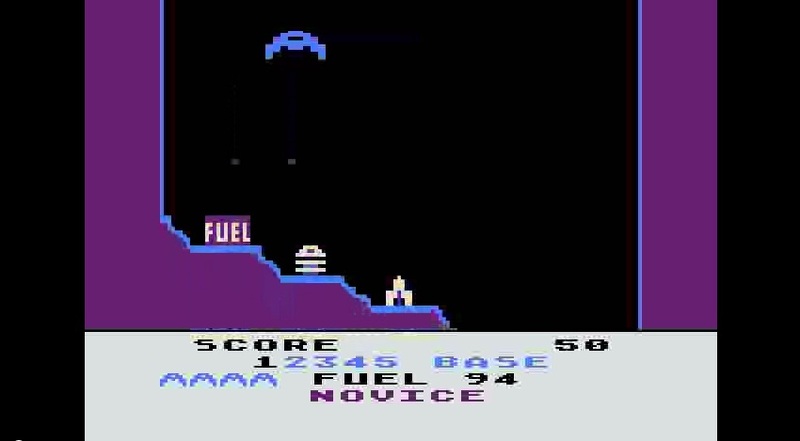 As with most 2600 games of the era, the graphics are dramatically simplified with all of the sprites being mono-colored. In fact, the graphics are pretty horrible as the hotdog, pickle, and egg are just flickering colored squares and it is hard to judge exactly where they are at and, therefore, it is hard to ‘drop’ them. Control with the standard CX40 joystick is pretty bad and BurgerTime for the 2600 is not really much fun to play. I paid a $1 for a copy of BurgerTime and that was about 99 cents too much. Unless you are a die hard 2600 and BurgerTime fan, don’t waste your time or money on this horrible port. Hopefully, in the not too distant future, someone in the homebrew community will develop an updated and improved 2600 version of BurgerTime. An official 5200 version of BurgerTime was never developed, probably due to the video game crash of 1983 and Atari’s cancelling of the 5200 in 1984. Fortunately, in 2004, Ken Siders developed a BurgerTime clone for the 5200 that he named ‘Beef Drop’. Ken started this as an April Fool’s joke on the AtariAge forum, initially claiming that he had found a lost prototype. In fact, Ken was planning to develop Beef Drop for the 5200 and posted an early version of his work as a tease. Ken’s 5200 version has all of the arcade elements and the graphics, while simplified, are pretty awesome for a 5200 game. Ken includes all four arcade screens and took full advantage of the 5200’s pokey sound chip to replicate the arcade sounds. Control with a standard 5200 joystick is good and the game does not suffer from analog control like many other ports for the 5200. If you are a fan of the 5200, I can highly recommend that you obtain a copy of Beef Drop for your collection! An official 7800 version of BurgerTime was also never developed, so for many years 7800 owners had to make do with the horrible 2600 version. In 2006, Ken Sliders came to the rescue with his version which he also called ‘Beef Drop’. Ken’s 7800 version looks and plays like the arcade and includes a cool intro screen. Since only one button is required for this game, you can use a standard CX40 joystick. Two versions of Beef Drop were developed for the 7800. The initial carts that Ken made available had a Pokey chip for arcade quality sound. My copy is the standard copy without the Pokey chip, but Ken still did a great job with the sounds for the standard Atari TIA chip. There is absolutely nothing bad that I can say about Beef Drop for the 7800…Ken has made this game almost arcade perfect! If you have a 7800, you need to go straight to the AtariAge store and order yourself a copy of this great game!!! Before doing the research for this post, I didn’t really know too much about BurgerTime. I had purchased Beef Drop for my 7800 about a year ago, but had played some of my other classic games more often and, like b*nQ, it was just taking up space in my collection. In the past couple of weeks, as I prepared for this post, I have really enjoyed learning about BurgerTime and playing Ken’s awesome versions for the 5200 and 7800. Although I recommend skipping Mattel’s 2600 version, you can’t go wrong with Beef Drop for either your 5200 or 7800. If you have multiple systems, Ken’s 7800 version is almost arcade perfect and a must have! One final note is that Ken also as developed an 8-bit version of Beef Drop for the XEGS and Atari 8-bit computers. This too is available from AtariAge. Categories: 2600, 5200, 7800, Atari, Game Reviews | Tags: 2600, 5200, 7800, Atari, BurgerTime, VCS, XEGS | Permalink.